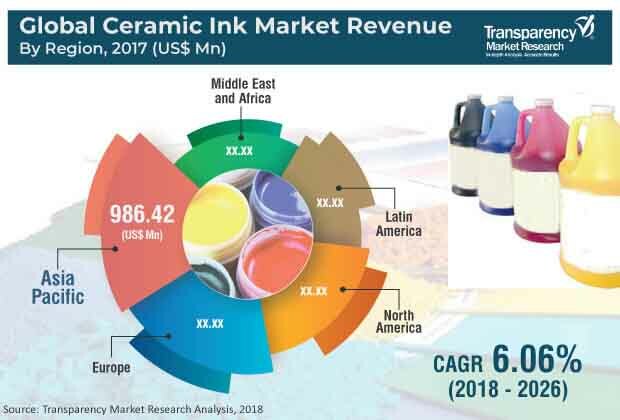 The global ceramic inks market was valued at around US$ 1.9 Bn in 2017 and is anticipated to expand at a CAGR of more than 6.0% from 2018 to 2026, according to a new report by Transparency Market Research (TMR) titled ‘Ceramic Inks Market – Global Industry Analysis, Size, Share, Growth, Trends, and Forecast, 2018–2026.’ Ceramic inks are carriers of ceramic fine particle metallic oxide pigments suspended in a medium to give them the physical consistency required for producing fine details. These inks are used for printing designs and patterns on ceramic products such as tiles, tableware, and glass. Ceramic inks are used to develop and print designs on ceramic tiles and glass. These products are commonly employed in the construction industry. They are required in the construction of almost every residential and commercial building. Hence, investment in construction industry is an important driver of the ceramic inks market. Ceramic inks are highly resistant to weather, water, and several other liquids. This makes ceramic ink an ideal material to print design on decorative glass and ceramic products such as ceramic tiles and tableware. Thus, the trend of using decorative glass and ceramic tiles in construction is likely to continue during the forecast period. This is estimated to propel the consumption of ceramic inks. Ceramic inks are used to print designs on ceramic tiles, tableware, and glass. They are also used to print designs on automotive ceramics. Ceramics are employed in several other industries such as water treatment, medicine, and electronics; however, these industries do not use ceramic inks. This is hindering the ceramic inks market. Digital printing technology is gradually replacing analog printing technology due to its advantages such as higher customization, mass production, low cost, environment-friendliness, and rapid changes to design. Ceramic ink manufacturers are developing inks specifically for digital printing technology in order to meet the rising demand for digital printing technology. Ceramic inks developed specifically for digital printing technology are costlier than those developed for analog printing technology. Ceramic inks developed for digital printing technology use a different combination of chemical formulations and coloring pigments compared to analog printing technology-specific ceramic inks. Furthermore, these inks cover a wider range of colors. Manufacturers need to ensure that the inks can withstand a broad range of temperatures. In terms of technology, the global ceramic inks market can be bifurcated into digital printing technology and analog printing technology. The former holds larger share due to its advantages such as low cost and higher customization. In terms of type, the market can be segregated into functional inks and decorative inks. Majority of end-products of ceramic ink are used for decorative purposes. Hence, the share of the decorative inks segment is higher than that of functional inks. Based on application, the market can be classified into ceramic tiles (residential decorative tiles and commercial decorative tiles), glass printing, tableware, and others (including automotive ceramics). The ceramic tiles accounts for dominant share of the market. In terms of region, the market can be split into North America (the U.S. and Canada), Latin America (Brazil, Mexico, and Rest of Latin America), Europe (Germany, the U.K., France, Italy, Spain, Russia & CIS, and Rest of Europe), Asia Pacific (China, India, Japan, ASEAN, and Rest of Asia Pacific) and Middle East & Africa (GCC, South Africa, and Rest of Middle East & Africa). Asia Pacific is the prominent consumer of ceramic inks, primarily due to the large amount of ceramic tiles are manufactured in the region. Manufacturers of ceramic tiles are one of the largest consumers of ceramic inks. Ceramic inks is a highly fragmented market with a large number of local manufacturers. However, the market also consists of some multinational companies such as Ferro Corporation, Zschimmer & Schwarz GmbH & Co KG, Chemische Fabriken, Esmalglass – Itaca Group, and Gruppo Colorobbia. It is relatively easy to enter the ceramic inks market; hence, the numbers of players in the market are expected to keep increasing during the forecast period. Rise in number of players is estimated to directly affect the price of ceramic inks; the price is likely to decline during the forecast period.